Lake-effect snow led to maybe as much as 1 cm more dusting overnight, and the temperatures have been just barely getting up to freezing. But where the sun hits and there's no wind, it can get tolerably warm. I wish this photo properly captured the dramatic lighting yesterday evening near sunset. 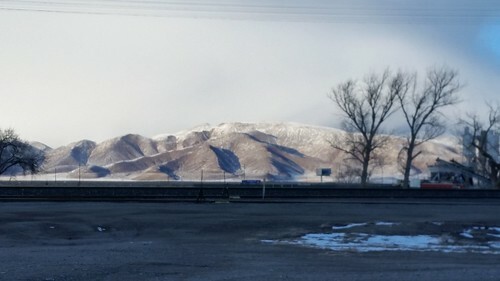 Just after I took this photo a bunch of low clouds rolled in from the north to cover these hills. 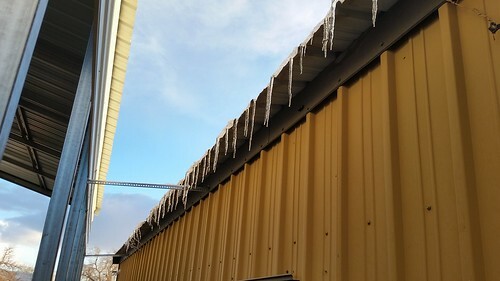 The roof of the garage warmed in the sun enough to generate these icicles, some of which ended up horizontal and re-attached to the side of the garage. 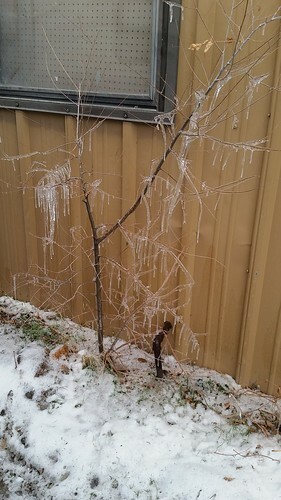 It was warm enough to melt the snow on the roof, but when it dripped back into the shade, it refroze on this little bush. This afternoon after work, Lisa got the Big Orange Van running and we went to Big R to buy a pallet of North Idaho Energy Logs. We hope to get it unloaded tomorrow before the next snowstorm blows in late Wednesday night.